Roughly seven-in-ten white evangelical Protestants (69%) say they approve of the way Trump is handling his job as president, according to the Center’s latest polling in January 2019. This is somewhat lower than Trump’s approval rating in the earliest days of his tenure – when about eight-in-ten white evangelicals (78%) approved of his job performance – but is in line with most polls conducted by the Center since the inauguration. White evangelicals’ support for the president has been consistently high, and many prominent evangelical leaders, such as Jerry Falwell Jr. – the president of Liberty University – have steadfastly stood with the president. In most of the 11 surveys conducted by the Center since Trump’s inauguration, between 46% and 55% of white mainline Protestants have approved of the president, including 48% in the January 2019 survey. Around half of white Catholics have approved of Trump in these surveys, including 44% in January. Religiously unaffiliated Americans consistently express among the lowest levels of approval of Trump’s performance, ranging from 17% to 27% across the polls the Center has conducted since the president assumed office. 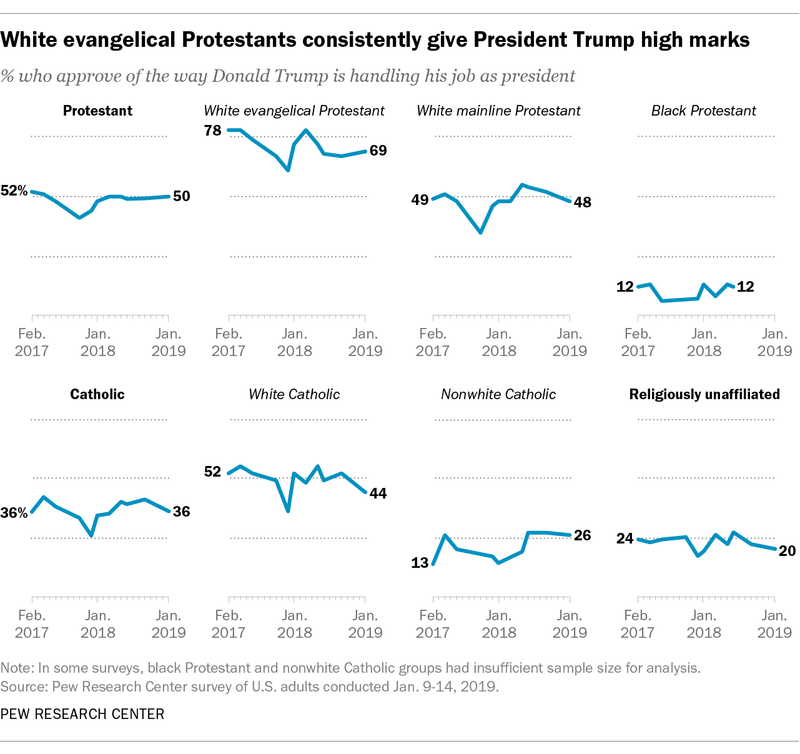 Most black protestants and nonwhite Catholics also have disapproved of the way the president handles his job. While white evangelical Protestants generally give Trump high approval ratings, that does not mean they have no reservations about him. An August 2018 survey found that roughly half of white evangelicals do not think that Trump has set a high moral standard for the presidency since taking office. Some prominent evangelical leaders, such as Rick Warren, pastor of Saddleback Church, have expressed ambivalence about Trump and concern about some of his policies. Others, such as Beth Moore, founder of Living Proof Ministries, openly oppose the president. Still, white evangelicals make up a staunchly and increasingly Republican group that generally backs Trump and his policies. In the January 2019 survey, for instance, nearly three-quarters of white evangelicals expressed support for substantially expanding the wall along the U.S. border with Mexico. 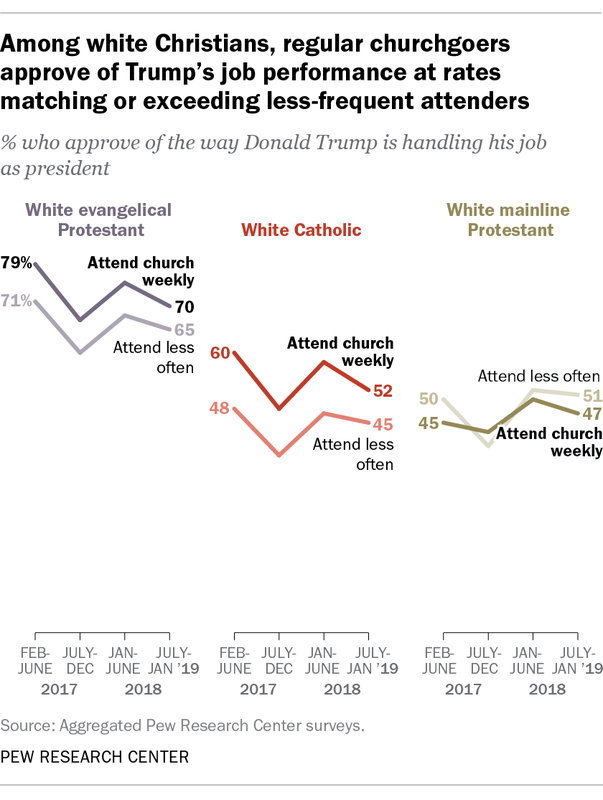 White evangelical Protestants who regularly attend church (that is, once a week or more) approve of Trump at rates matching or exceeding those of white evangelicals who attend church less often. Indeed, in the first few months of Trump’s presidency, white evangelicals who attended church at least weekly were significantly more likely than less-frequent churchgoers to approve of Trump’s performance (79% vs. 71%). In the most recent period analyzed – from July 2018 to January 2019 – 70% of white evangelicals who attend church at least once a week approve of Trump, as do 65% of those who attend religious services less often. Among white mainline Protestants, approval of the president is not meaningfully different between weekly attenders and those who attend less often. Smaller religious groups such as Mormons and Muslims cannot be reliably analyzed from a single poll because of the limitations of sample size. But the views of members of smaller religious groups can be assessed by combining results from all 11 Pew Research Center polls conducted between February 2017 and January 2019. Looking at the period of Trump’s presidency overall, about half of Mormons (52%) approve of his job performance, while smaller shares of Jews (24%) and Muslims (18%) say the same.